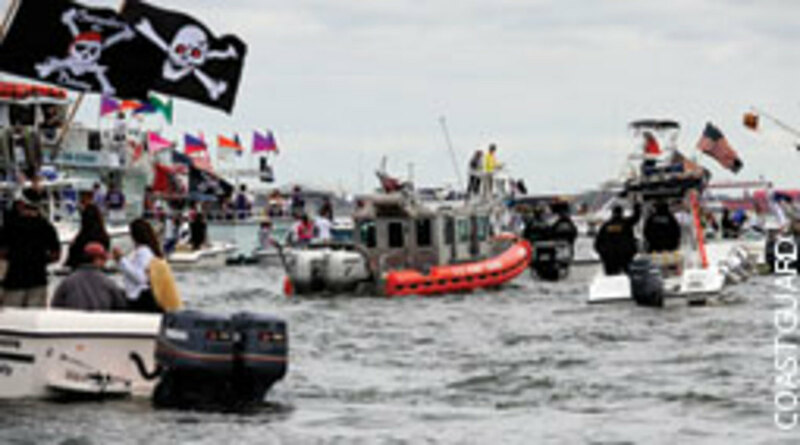 PARTY CRASHERS: The Coast Guard, Coast Guard Auxiliary and Florida Fish and Wildlife Conservation Commission teamed with local law enforcement agencies earlier this year to keep waterways safe during the Gasparilla Pirate Fest in Tampa, Fla. Police made 52 arrests, including eight for boating under the influence, and issued 302 citations for carrying an open container of alcohol. Boating and paddling fatalities in the Northeast remained nearly the same for the third year in a row. 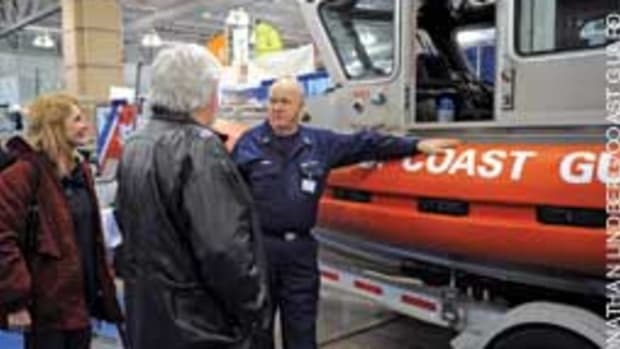 The First Coast Guard District in Boston recorded a preliminary total of 51 deaths in 2011. There were 50 fatalities in 2009 and 51 in 2010. Of the 51 boaters who died last year, 44 were not wearing life jackets. 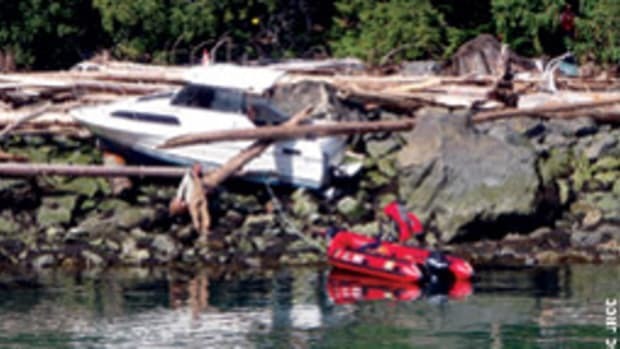 There were 29 deaths on powerboats and 22 on non-motorized boats. A Coast Guard helicopter crew hoisted three people from a sailboat that ran aground Jan. 22. 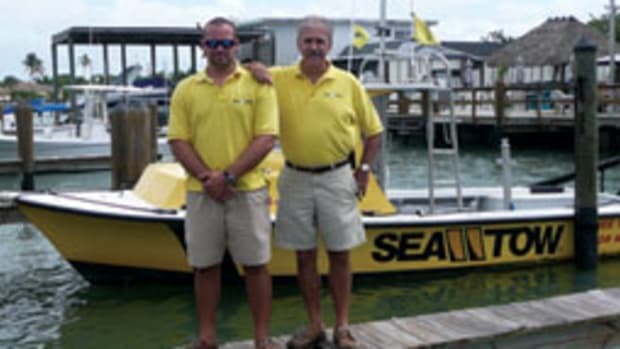 Crewmembers aboard the 26-footer Honey Badger made a mayday call on VHF channel 16, notifying watchstanders that they were on a shoal near Rawls Island. The watchstanders dispatched a 47-foot Motor Lifeboat from Station Hatteras Inlet and an MH-60 Jayhawk helicopter from Air Station Elizabeth City. The Jayhawk crew brought the three people aboard and took them to Air Station Elizabeth City. Two angleers are safe after capsizing Jan. 31 about 13 miles west of Stump Pass, Fla. Watchstanders aboard the Coast Guard cutter Diamondback happened to see the men sitting on the hull of their overturned boat, frantically waving their arms. the Diamondback launched a small-boat crrew, which brought the men aboard the cutter. 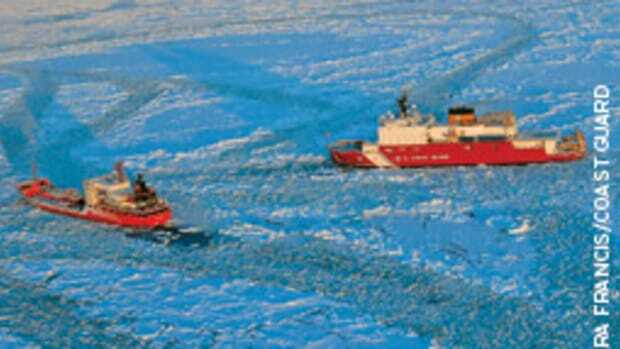 "Their vessel capsized prior to them making any callouts for help, and they didn&apos;t have any kind of signaling equipment on board," Senior Chief Petty Officer Robert Wood says. No injuries were reported. 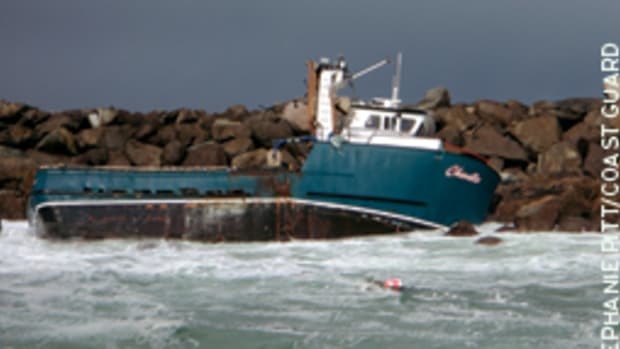 Five fishermen are safe after their vessels sank in two separate incidents during the first weekend in January. On Jan. 7, the West Kingston, R.I.-based fishing boat Elizabeth Helen was hauling in its catch when the 55-footer sank 3 miles northeast of Block Island, R.I. 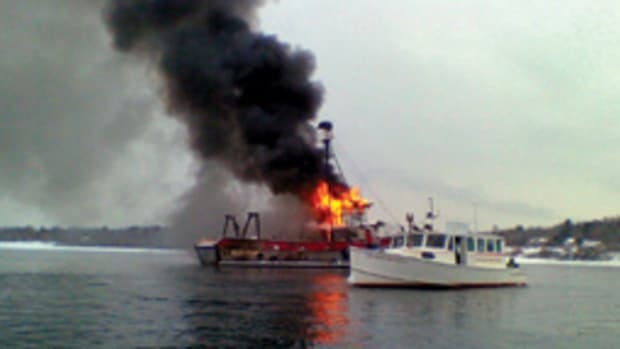 The two fishermen activated their EPIRB at 3:54 p.m., and Station Point Judith launched a 47-foot Motor Lifeboat, which spotted the red flares the men fired from their life raft. At 4:48 p.m., they were taken aboard and brought to shore, where they were checked by local medical personnel and released. On Jan. 8, the crew of the fishing boat Vincenzo, based in Hampton Bays, N.Y., abandoned the 43-footer after it began taking on water 12 miles south of Shinnecock on the south shore of Long Island. The three crewmembers put on their survival suits, radioed for help and got into their life raft. The Coast Guard launched a rescue boat from Station Shinnecock and issued a radio broadcast asking mariners in the area to render assistance. The fishing vessel Rhonda & Denise rescued the three fishermen and later transferred them to a Coast Guard rescue boat. No injuries were reported. 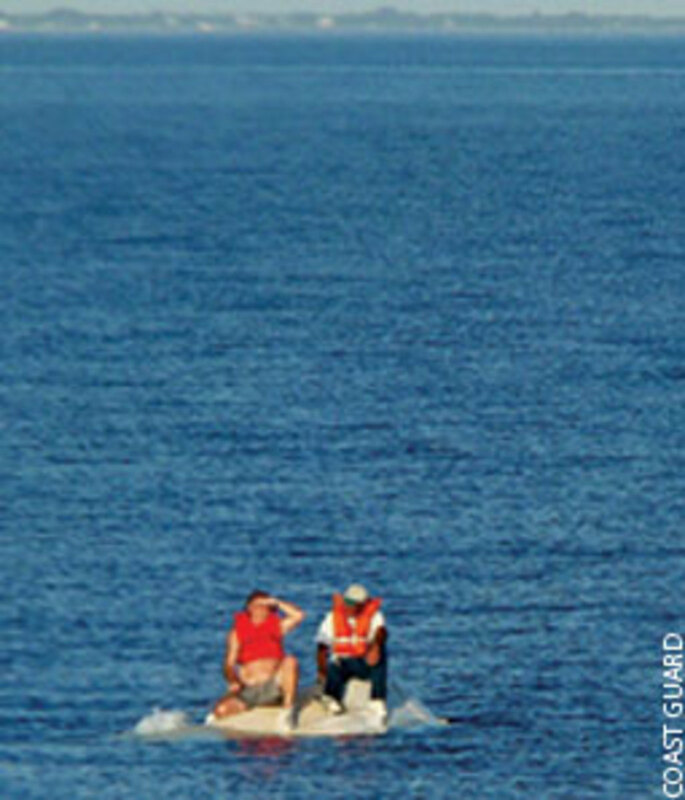 The Coast Guard coordinated the Feb. 8 rescue of two adults and a child aboard a 38-foot sailboat that sank 280 miles northeast of Hilo, Hawaii. The crew of Liahona, en route from Puerto Vallarta, Mexico, to Hilo, contacted the Coast Guard cutter Kiska at 5:26 p.m. the previous day after becoming disabled in seas of 6 to 13 feet and winds of 34 mph. The Coast Guard Joint Rescue Coordination Center Honolulu contacted the 893-foot container ship Horizon Reliance and requested assistance under the Automated Mutual Assistance Vessel Rescue System. The ship reached the disabled vessel at 1:30 a.m. the next day, but as it approached it struck the sailboat, according to the Coast Guard. 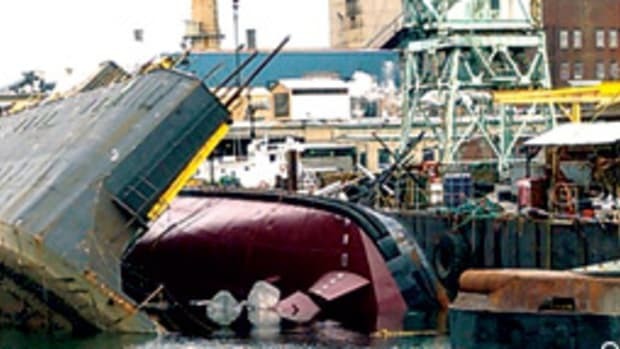 Liahona capsized and sank. Winds were gusting to 40 knots and swells were in the 20-foot range. All of the passengers aboard the sailboat were wearing life jackets with strobe lights, enabling rescuers to keep them in sight. All three were in good condition and were returned to Honolulu aboard the ship.